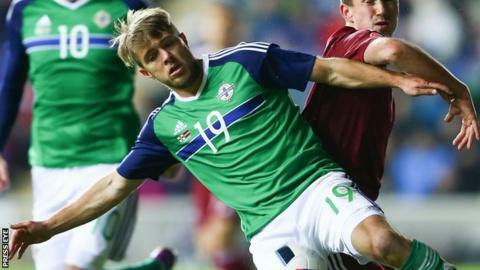 Northern Ireland striker Jamie Ward faces an anxious wait to find out the extent of a hamstring injury sustained while playing for Nottingham Forest in a Championship game on Monday night. Ward hopes the injury will not threaten his hopes of appearing at Euro 2016 in France, which starts in June. The 29-year-old was forced to come off during the first half of his side's 2-1 home defeat. The problem will be assessed by his club's medical team on Tuesday. Forest head coach Paul Williams said: "Jamie has a hamstring problem, which is not great. "We will see how he is after the medical staff see him. Hopefully it will not be too bad." Northern Ireland manager Michael O'Neill will be without West Bromwich Albion defender Chris Brunt for this summer's tournament because of an anterior cruciate ligament injury. O'Neill's men begin their Group C campaign against Poland on 12 June, followed by fixtures against Ukraine on 16 June and Germany on 21 June.